Learn Trigonometry for Game Programming in this 2-part tutorial series, where you’ll learn the theory and then practice by making a space shooter game! Learn Trigonometry for game programming! Does the thought of doing mathematics give you cold sweats? Are you ready to give up on your career as a budding game developer because the math just doesn’t make any sense to you? Don’t fret – math can be fun, and this cool 2-part game tutorial will back up that claim! Here’s a little secret: as an app developer, you don’t really need to know a lot of math. If you can add or multiply two numbers together, you’re already halfway there. Most of the computations that we do in our professional lives don’t go much beyond basic arithmetic. That said, for making games it is useful to have a few more math skills in your toolbox. You don’t need to become as smart as Archimedes or Einstein, but a basic understanding of trigonometry, combined with some common sense, will take you a long way. In this tutorial, you will learn about some important trigonometric functions and how you can use them in your games. Then you’ll get some practice applying the theories by developing a simple spaces shooter iPhone game that requires a lot of trigonometry, using the Cocos2D game framework. Don’t worry if you’ve never used Cocos2D before or are going to use a different framework for your game – the mathematics we’ll cover in this tutorial will apply to your engine no matter what. And you don’t need any prior experience, as I’ll walk through the process step-by-step. If you supply the common sense, this tutorial will get you up to speed on the trig, so let’s get started! It sounds like a mouthful, but trigonometry simply means calculations with triangles (that’s where the tri comes from). You have X and Y position of each ship, but how can you find the length of that line? Then, since you know the X and Y coordinates of each ship, you can compute the length of each of the new lines. Now that you know the lengths of two sides of the triangle, you can use some Trigonometry to compute the length of the diagonal line – the distance between the ships. Note that one of the corners of this triangle has an angle of 90 degrees. 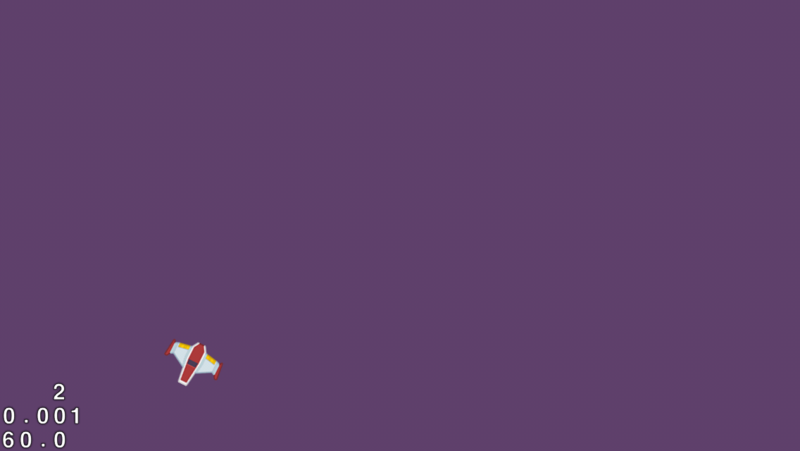 This is also known as a right triangle, and that’s the sort of triangle you’ll be dealing with in this tutorial. Any time you can express something in your game as a triangle with a 90-degree right angle – such as the spatial relationship between the two sprites in the picture – you can use trigonometric functions to do calculations on them. So in summary, Trigonometry is the mathematics that you use to calculate the lengths of the sides of these triangles, as well as the angles between those sides. And that comes in handy more often that you might think. All of this and more you can do with the power of Trigonometry! In the picture above, the slanted side is called the hypotenuse. It always sits across from the corner with the 90-degree angle (also called a right angle), and it is always the longest of the three sides. The two remaining sides are called the adjacent and the opposite, as seen from one particular corner of the triangle, the bottom-left corner in this case. 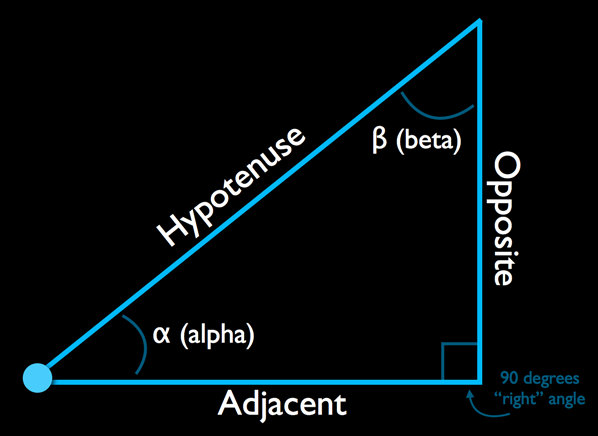 Alpha (α) and beta (β) are the names of the two other angles. You can call these angles anything you want (as long as it sounds Greek!) 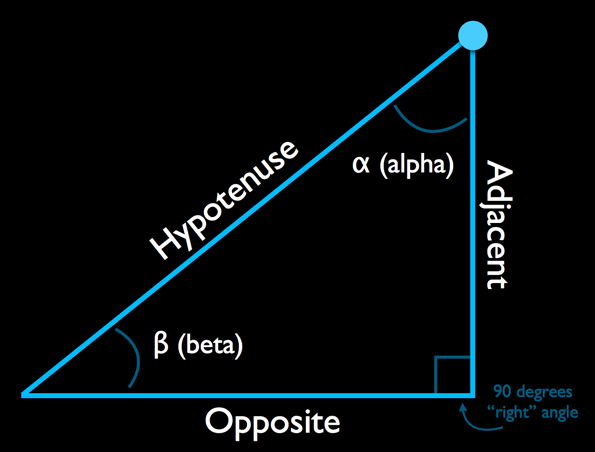 but usually alpha is the angle in the corner of interest and beta is the angle in the opposing corner. In other words, you label your opposite and adjacent sides with respect to alpha. Think of the sin, cos, and tan functions as “black boxes” – you plug in numbers and get back results. They are pre-written functions you can call from almost any programming language. In other words, if sin(a) = b, then it is also true that arcsin(b) = a. Of these inverse functions, you will use the arc tangent (arctan) the most in practice. Sometimes these functions are also notated as sin-1, cos-1, and tan-1, so don’t let that fool you. Is any of this sinking in or sounding familiar? Good, but you’re not done yet with the theory lesson – there is still more that you can calculate with triangles. Sometimes you may know the length of two of the sides and need to know the length of the third, like in the example at the beginning of this tutorial where you wanted to find the distance between the two space ships. If you know any two of these sides, then calculating the third is simply a matter of filling in the formula and taking the square root. This is a very common thing to do in games and you’ll be seeing it several times in this tutorial. Note: Want to drill this formula into your head while having a great laugh at the same time? Search YouTube for “Pythagoras song” – it’s an inspiration for many! The remaining two angles must add up to 90 degrees. So if you know alpha, you also know beta, and vice-versa. And those are all the formulas you need to know! Which one to use in practice depends on the pieces that you already have. Usually you either have the angle and the length of at least one of the sides, or you don’t have the angle but you do have two of the sides. To Skip, or Not to Skip? Then feel free to skip ahead to the Begin the Trigonometry! section below – I have a starter project waiting for you there. To get started, download the latest version of the Cocos2D v2.1 branch. 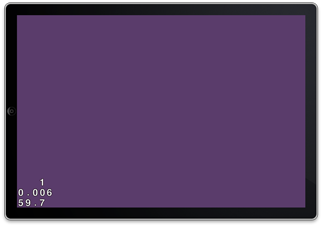 At the time of writing, this is the “unstable” version cocos2d-iphone-2.1-rc1. You should see “Installing cocos2d templates” and a bunch of messages. 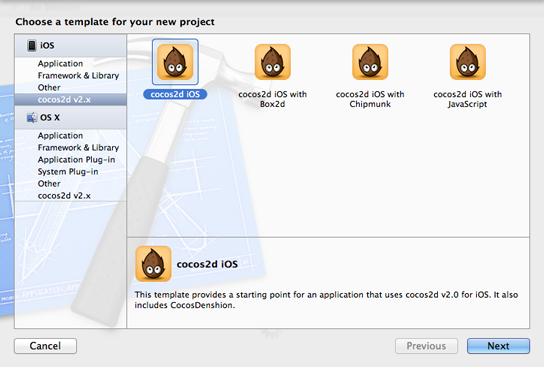 Now you’re ready to work with Cocos2D. 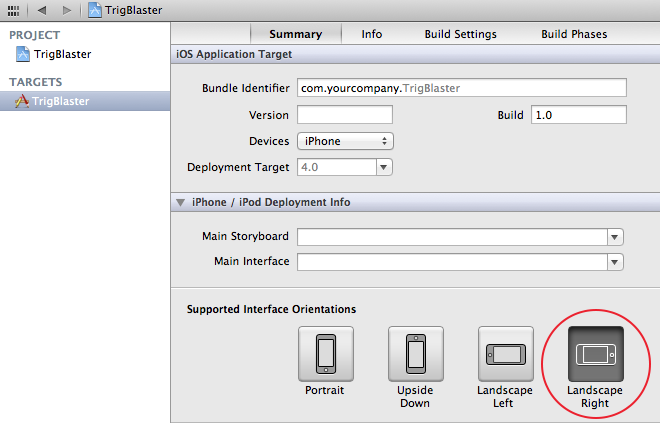 Fire up Xcode and create a new application from the “cocos2d iOS” template you just installed. 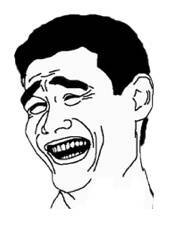 You are going to use ARC in this project, but Cocos2D projects have it disabled by default. Luckily, enabling ARC is really easy. Just go to Edit\Refactor\Convert to Objective-C ARC. Expand the drop-down and select only the last four files (main.m, AppDelegate.m, HelloWorldLayer.m, and IntroLayer.m), then click Check and finish the steps in the wizard. Note: When you convert a project to ARC or make other large changes, Xcode will prompt you to enable snapshots for the current project. A snapshot saves the state of the entire project as if you copied and pasted the project into another directory. You can learn more about snapshots over here. For the purposes of this tutorial, select disable. Next download the resources for this tutorial. This file contains the images for the sprites and the sound effects. 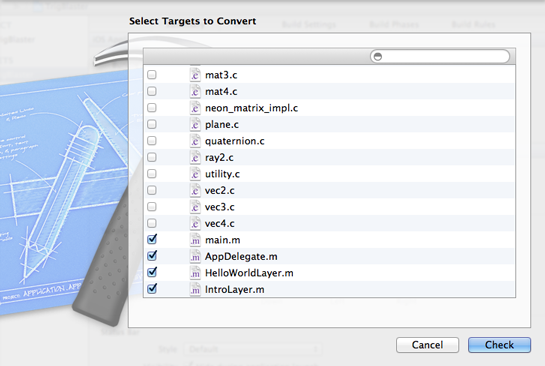 Unzip it and drag the Images and Sounds folders into Xcode to add them to the project. 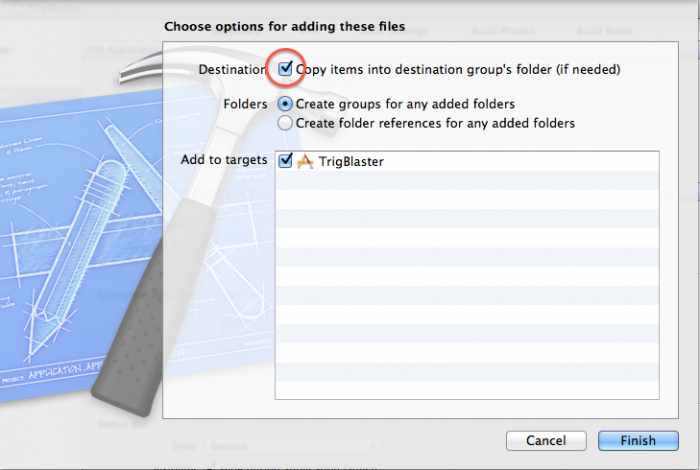 In the import dialog, make sure Copy items into destination group’s folder is checked. Great, the preliminaries are over and done with – now let’s get coding for real. 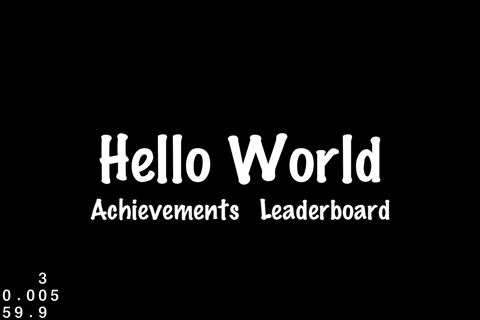 Because this is a simple game, you will be doing all your work inside a single class: the HelloWorldLayer. Right now, this layer contains a bunch of stuff that you don’t need. This game doesn’t use GameKit, so you got rid of that. You also changed HelloWorldLayer from a plain CCLayer to a CCLayerColor so that you can have a background color other than just black. 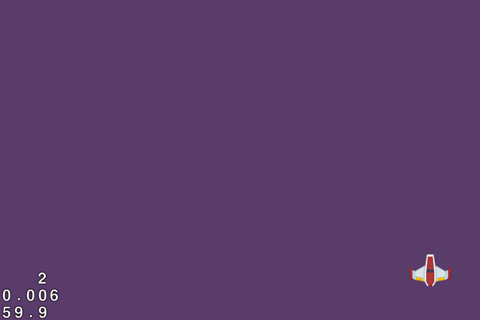 The scene method is unchanged from the template, but init now calls [super initWithColor] to set a purple background color on the layer. The _winSize variable stores the dimensions of the screen, which is useful because you will be referring to that quite often. The _playerSprite variable holds the spaceship sprite. This is all pretty basic if you have worked with Cocos2D before. The player sprite is positioned in the bottom-right corner of the screen. Remember that with Cocos2D, it is the bottom of the screen that has y-coordinate 0, unlike in UIKit, where y = 0 points to the top of the screen. To move the spaceship, this game uses the iPhone’s built-in accelerometers. Unfortunately, the iOS Simulator cannot simulate the accelerometers. That means that from now on, you will need to run the app on your device to test it. Note: If you are unsure how to put the app on your device, check out this extensive tutorial that explains how to obtain and install the certificates and provisioning profiles that allow Xcode to run apps on your device. It’s not as intimidating as it looks, but you do need to sign up for the paid Apple developer program. To move the spaceship with the accelerometers, you’ll obviously be rocking your device from side to side. During testing I found that this sometimes caused the screen to autorotate from landscape right to landscape left, which is really annoying when you’re in the middle of a heated battle. To prevent that from happening, go into the Target Settings screen and in the Summary tab under Supported Interface Orientations, de-select all options except for Landscape Right. Using the accelerometers from code is pretty straightforward. You first ask Cocos2D to activate the accelerometers. Once enabled, it sends you periodic updates with the values of the three accelerometers that are built into the iPhone. You then use these values to change the speed of the spaceship. First, add new instance variables to keep track of the accelerometer values. You only store the values for two of the accelerometers; the “Z” one isn’t used by this game. This bit of logic is necessary to filter – or “smoothen” – the data that you get back from the accelerometers so that it appears less jittery. Note: An accelerometer records how much gravity currently pulls on it. Because the user is holding the iPhone in her hands, and hands are never completely steady, there are a lot of tiny fluctuations in this gravity value. We are not so much interested in these unsteady motions as in the larger changes in orientation that the user makes to the device. By applying this simple low-pass filter, you retain this orientation information but filter out the less important fluctuations. Now that you have a stable measurement of the device’s orientation, how can you use this to make the player’s spaceship move? Set the acceleration based on some form of user input, in this case from the accelerometer values. Add the new acceleration to the spaceship’s current speed. This makes the object speed up or slow down, depending on the direction of the acceleration. 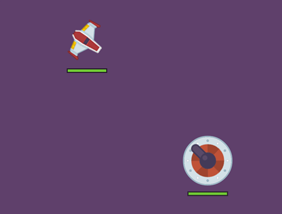 Add the new speed to the spaceship’s position to make it move. 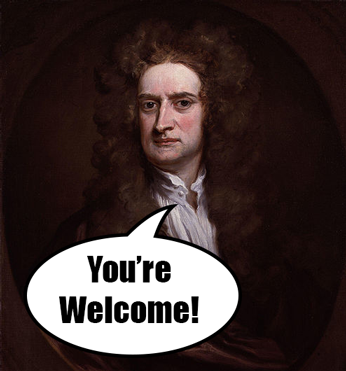 Of course, you have a great mathematician to thank for these equations: Sir Isaac Newton! You need some more instance variables to pull this off. There is no need to keep track of the player’s position because the CCSprite already does that for you, but acceleration and speed are your own responsibility. It’s good to set some bounds on how fast the spaceship can travel or it would be pretty hard to maneuver. Infinite acceleration sounds like a good idea in theory but in practice it doesn’t work out so well (besides, even Einstein thinks there are limits to how fast you can go). This defines two constants, the maximum acceleration (400 points per second squared) and the maximum speed (200 points per second). This is a basic technique for controlling a sprite using the accelerometers. When the device is tilted to the left, you give the player maximum acceleration to the left. Conversely, when the device is tilted to the right, you give the player maximum acceleration to the right. Likewise for the up and down directions. Note: You’re using the _accelerometerY value for the x-direction. That’s as it should be. Remember that this game is in landscape, so the Y-accelerometer runs from left to right in this orientation, and the X-accelerometer from top to bottom. You’re almost there. 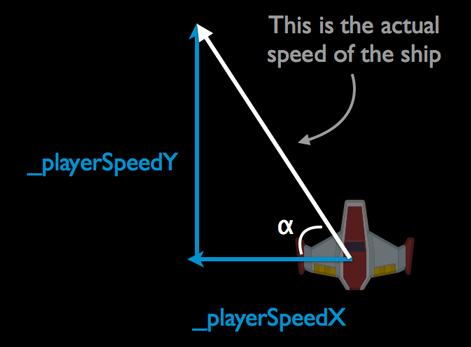 The last step is applying the _playerAccelX and Y values to the speed and position of the spaceship. You will do this in the game’s update method. This method is called 60 times per second, so it’s the natural place to perform all of the game logic. Add the current acceleration to the speed. The acceleration is expressed in points per second (actually, per second squared, but don’t worry about that) but update: is performed a lot more often than once per second. To compensate for this difference, you multiply the acceleration by the elapsed or “delta” time, dt. Without this, the spaceship would move about sixty times faster than it should! However, I like the succinctness of the one-line version. fminf() makes sure the speed doesn’t become larger than MaxPlayerSpeed because it always picks the smallest of the two, while fmaxf() makes sure the speed doesn’t drop below -MaxPlayerSpeed because it always picks the largest value. It’s a neat little trick. 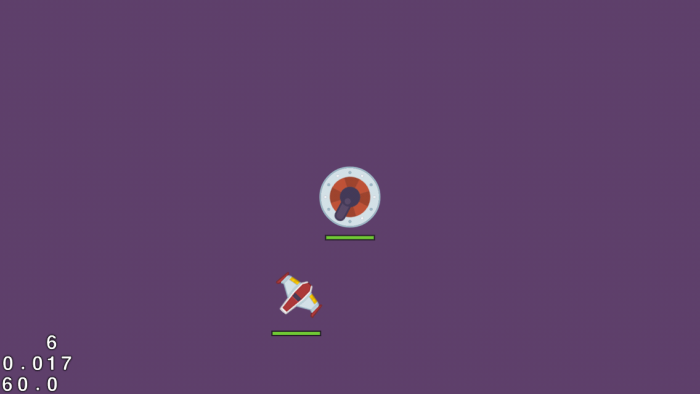 Add the current speed to the sprite’s position. Again, speed is measured in points per second, so you need to multiply it by the delta time to make it work correctly. Clamp the new position to the sides of the screen. You don’t want the player’s spaceship to go offscreen, never to be found again! That should do it. Build and run the game. You can now control the spaceship by tilting the device. If you skipped ahead to this section, here is the starter project at this point. Build and run it on your device – you’ll see there’s a spaceship that you can move around with the accelerometer. You haven’t seen any trigonometry yet, so let’s put some into action. Note: If you’ve used Cocos2D before, you might know Cocos2D comes with handy built-in methods like ccpLength, ccpAngle, and more that are wrappers over the raw trigonometry functions for ease of use. In this tutorial, you will not be using these functions – instead you will be going low level and issuing the raw trigonometry calls yourself, for the learning experience. In an actual game, you might want to use the wrapper methods however. It would be cool – and much less confusing to the player! – to rotate the spaceship in the direction it is currently moving rather than having it always pointing upward. To rotate the spaceship, you need to know the angle to rotate it. But you don’t know what that is, so how can you figure that out? Here you know the lengths of the adjacent (_playerSpeedX) and the opposite (_playerSpeedY) sides. So basically, you know 2 sides of a right triangle, so you are in the Know 2 Sides, Need Angle case mentioned in the beginning of this tutorial. That means you need to use one of the inverse functions: arcsin, arccos or arctan. The Objective-C math library comes with the atan() function that computes the arc tangent, but it has one big issue: what if the x-speed is 0? In that case, the adjacent is 0 and dividing by 0 is mathematically undefined. Your app might crash or just behave weirdly when that happens. This is another reason why atan2() is a lot more useful than plain, old atan(). Note that the arctan function you are using is actually called atan2f() instead of just atan2(). More about that in a moment. Also notice that the y-coordinate goes first. A common mistake is to write atan2f(x, y) but that’s the wrong way around. Remember the first parameter is the opposite, and in this case the Y coordinate is the opposite. Hmm, this doesn’t seem to be working quite right. What is wrong here? 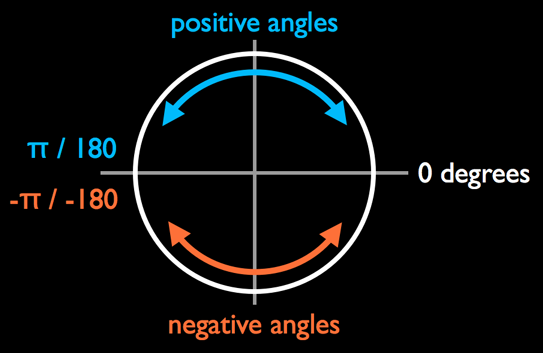 Normal human beings tend to think of angles as values between 0 and 360. Mathematicians, however, measure angles in radians, which are expressed in terms of π (the Greek letter Pi, which sounds like pie but doesn’t taste as good). It’s not essential to understand, but if you’re curious, one radian is the angle you get when you travel the distance of the radius along the arc of the circle. You can do that 2π times (roughly 6.28 times) before you end up at the beginning of the circle again. So while you may think of angles as values from 0 to 360, a mathematician sees values from 0 to 2π. And that’s where your problem lies. atan2f() returns a value in radians but Cocos2D’s sprite rotation property expects degrees. That’s why you only saw the sprite rotate a little: angles measured in radians are much smaller than angles measured in degrees. So what the @#! is π? Pi is the ratio of the circumference of a circle to its diameter. In other words, if you measure the outside of any circle and divide it by its diameter (which is twice the radius), you get the number 3.141592… and that is what we call π. 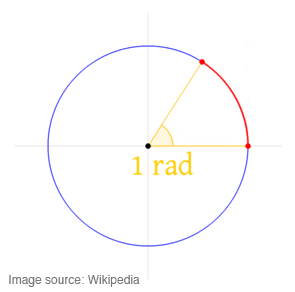 It takes 2π radians to go all the way around a circle, which is why 360 degrees corresponds to 2π. Pi is a very important concept in mathematics that shows up all the time, especially with anything that is cyclical. By the way, not everyone likes π. Some people believe that it would have been better to choose the ratio of the circumference to the radius, instead of to the diameter. This number is called tau (τ) and is equal to 2π, thus simplifying many of the calculations. You can read more about tau at tauday.com. Anyway, back to the game. Build and run to see some glorious rotation in action. Whoops, something is still not right. 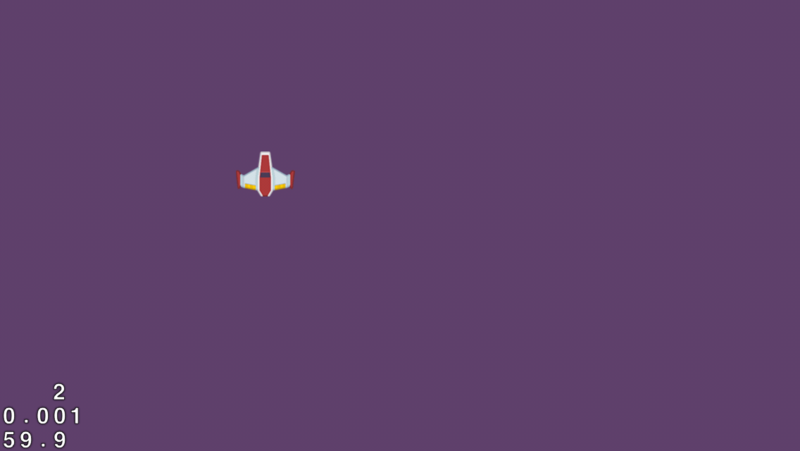 The spaceship certainly rotates but it seems to be pointing in the direction opposite to where it’s flying! And that’s not the only problem: in Cocos2D, rotation happens in a clockwise direction, but in mathematics it goes counterclockwise. This adds 90 degrees to make the sprite point to the right at an angle of 0 degrees, so that it lines up with the way atan2f() does things. Then it adds the negative angle – in other words, subtracts the angle – in order to rotate the proper way around. Build and run once more to try it out. You’ll finally have a spaceship that has its head on straight! You have a spaceship that you can move using the accelerometers and you’re using trig to make sure it points in the direction it’s flying. That’s a good start. Unfortunately, having the spaceship get stuck on the edges of the screen isn’t very satisfying. You’re going to fix that by making it bounce off the screen borders instead. This checks whether the spaceship hit any of the screen borders and if so, sets a BOOL variable to YES. But what to do after such a collision takes place? To make the spaceship bounce off the border, you can simply reverse its speed and acceleration. If a collision registered, you flip the acceleration and speed values around. Notice that this also multiplies the acceleration and speed by a damping value, BorderCollisionDamping. As usually happens in a collision, some of the movement energy is dissipated by the impact. In this case, you make the spaceship retain only 40% of its speed after bumping into the screen edges. Try it out. Smash the spaceship into the border and see what happens. Who said spaceships can’t bounce? For fun, play with the value of BorderCollisionDamping to see the effect of different values for this constant. If you make it larger than 1.0f, the spaceship actually gains energy from the collision. Note: Now why is there an f behind those numbers in the code: 0.4f, 0.1f, 0.0f, and so on? 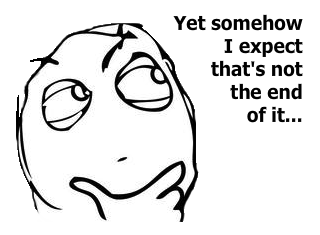 And why did you use atan2f() instead of just atan2()? When you write games, you want to work with floating point numbers as much as possible because, unlike integers, they allow for digits behind the decimal point. This allows you to be much more precise. There are two types of floating point numbers: floats and doubles (there is also a “long double”, but that’s the same as a double on the iPhone). Doubles are more precise than floats but they also take up more memory and are slower in practice. When you don’t put the f behind the number and just use 0.4, 0.1, 0.0, or when you use the version of a math function without the f suffix, you are working with doubles and not floats. It doesn’t really matter if you use a double here and there. For example, the time value that CACurrentMediaTime() returns is a double. However, if you’re doing hundreds of thousands of calculations every frame, you will notice the difference. I did a quick test on a couple of my devices and the same calculations using doubles were 1.5 to 2 times slower. So it’s a good habit to stick to regular floats where you can. You may have noticed a slight problem. Keep the spaceship aimed at the bottom of the screen so that it continues smashing into the border over and over, and you’ll see a constant flicker between the up and down angles. Using the arc tangent to find the angle between a pair of x- and y-components works quite well, but only if those x and y values are fairly large. In this case, the damping factor has reduced the speed to almost zero. When you apply atan2f() to very small values, even a tiny change in these values can result in a big change in the resulting angle. One way to fix this is to not change the angle when the speed is very slow. 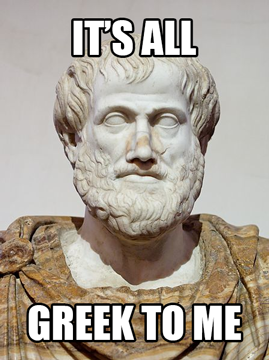 That sounds like an excellent reason to give a call to our old friend, Pythagoras. Here you are in the Know 2 Sides, Need Remaining Side case discussed earlier. Build and run. You’ll see the spaceship now acts a lot more stable at the edges of the screen. If you’re wondering where the value 40.0f came from, the answer is: experimentation. I put some NSLog() statements into the code to look at the speeds at which the craft typically hit the borders, and then I tweaked this value until it felt right. Of course, fixing one thing always breaks something else. Try slowing down the spaceship until it has stopped, then flip the device so the spaceship has to turn around and fly the other way. Previously, that happened with a nice animation where you actually saw the ship turning. But because you just added some code that prevents the ship from changing its angle at low speeds, the turn is now very abrupt. It’s only a small detail, but it is the details that make great products. The fix is to not switch to the new angle immediately, but to gradually “blend” it with the previous angle over a series of successive frames. This re-introduces the turning animation and still prevents the ship from rotating when it is not moving fast enough. The _playerAngle variable combines the new angle and its own previous value by multiplying them with a blend factor. In human-speak, this means the new angle only counts for 20% towards the actual rotation that you set on the spaceship. Of course, over time more and more of the new angle gets added so that eventually the spaceship does point in the proper direction. Note that the line that sets the _playerSprite’s rotation property is now outside the if statement. Now try flying in a circle a couple of times, both clockwise and counterclockwise. You’ll notice that at some point in the turn the spaceship suddenly spins in the opposite direction. It always happens at the same point in the circle. What’s going on? That means if you’re turning counterclockwise, at some point the angle will jump from +180 degrees to -180 degrees; or the other way around if you’re turning clockwise. And that’s where the weird spinning effect happens. The problem is that when the new angle jumps from 180 degrees to -180 degrees, _playerAngle is still positive because it is trailing behind a bit. When you blend these two together, the spaceship actually starts turning the other way around. It took me a while to figure out what was causing this! // Did the angle flip from +Pi to -Pi, or -Pi to +Pi? Build and run. That’ll fix things right up and you should have no more problems turning your spacecraft! This may have seemed like an arcane little problem not worth so much time, but it's good to be aware that atan2f() gives you angles from -180 degrees (or –π radians) to +180 degrees (or π radians). If you’re using arc tangent to calculate an angle and you get weird behavior like the spinning you saw here, then you might need to verify that your angles really are what you expect them to be. This is a great start - you have a spaceship moving along pretty smoothly! But so far the spaceship's life is too easy and carefree. Let's spice this up by adding an enemy: a big cannon! 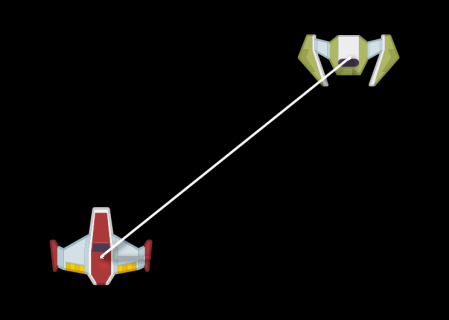 The cannon consists of two sprites: the fixed base and the turret that can rotate to take aim at the player. Build and run, and you should have a brand-new cannon sitting smack in the middle of the screen. Now you'll give the cannon a target to snipe at - I bet you know who! Yep, its turret should point at the player at all times. To get this to work, you need to figure out the angle to rotate the turret so that it points toward the player. 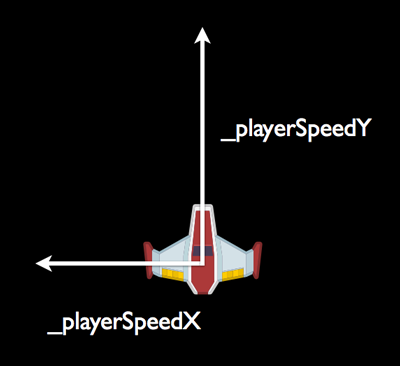 The deltaX and deltaY variables measure the distance between the player sprite and the turret sprite. You plug these values into atan2f() to get angle of rotation. As before, you need to convert this angle to degrees and adjust for the differences between mathematics and Cocos2D. Remember that atan2() always gives you the angle between the hypotenuse and the 0-degree line. It is not the angle inside the triangle. Build and run. The cannon is now always pointing at the spaceship. See how easy that was? That’s the power of trig for you! Challenge: It is unlikely that a real cannon would be able to act so instantaneously – it would have to be able to predict exactly where the target was going. Instead, a real cannon would always be playing catch up. You can accomplish this by “blending” the old angle with the new one, just like you did earlier. The smaller the blend factor, the more time the turret needs to catch up with the spaceship. See if you can implement this on your own. Adding Health Bars... That Move! 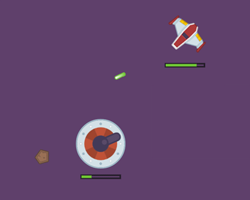 Soon the player will be able to fire missiles at the cannon, and the cannon will be able to inflict damage on the player. 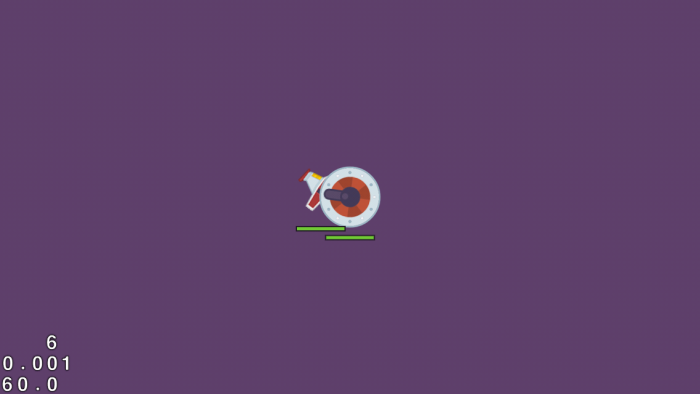 To show the amount of hit points each object has remaining, you will add health bars to the scene using CCDrawNode, a new feature of Cocos2D v2.1. The _playerHealthBar and _cannonHealthBar objects are instances of CCDrawNode, which is like a sprite except that you can draw arbitrary shapes into it. That is ideal for your health bars, which consist of a border and a filled rectangle. Note that you placed the _cannonHealthBar sprite slightly below the cannon, but didn’t assign a position to the _playerHealthBar yet. That’s because the cannon never moves, so you can simply set the position of its health bar once and forget about it. This sets up an array of points for the corners of the rectangle that you'll be drawing, then draws it twice: once for the border, which always has the same size, and once for the amount of health, which changes depending on the number of remaining hit points. Right now, the spaceship can fly directly over the cannon without consequence. It would be more fun if it didn't have it so easy and instead suffered damage for colliding with the cannon. This is where this tutorial enters the sphere of collision detection (don't miss that pun). At this point, a lot of game devs think, “I need a physics engine!” and reach for Box2D. While it’s certainly true that you can use Box2D for this, it’s not that hard to do collision detection yourself, especially when you can use circles. Detecting whether two circles intersect is a piece of cake: all you have to do is look at the distance between them (*cough* Pythagoras) and see if it is smaller than the radius of both circles. 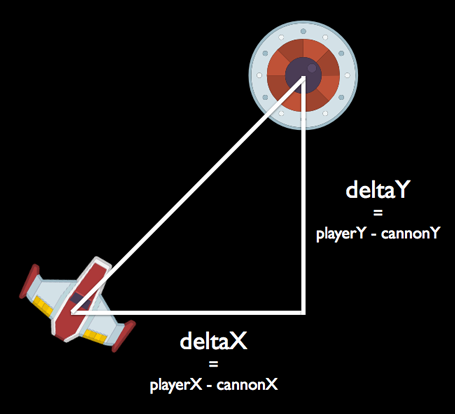 These are the sizes of the collision circles around the cannon and the player. Looking at the sprite, you’ll see that the radius of the cannon is slightly larger at 25 points, but it’s nice to have a bit of wiggle room. You don’t want your games to be too unforgiving or players will think it is unfair. The fact that the spaceship isn’t circular at all shouldn’t deter you. Often a circle is a good enough approximation of the shape of your sprite, and it has the big advantage that it makes it easy to do the necessary calculations. In this case, the body of the ship is roughly 20 points in diameter (remember, the diameter is twice the radius). You’ve seen how this works before: first you calculate the distance between the x-positions of the two sprites, then the y-distance. 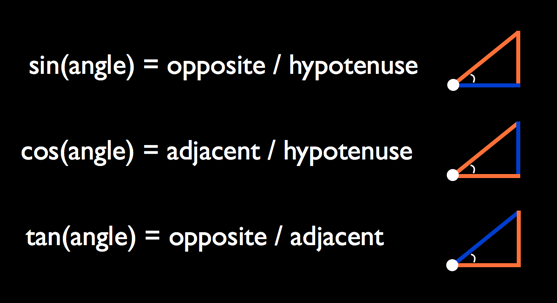 With these two values, you can calculate the hypotenuse, which is the true distance between these sprites. If that distance is smaller than the collision circles, a sound effect is played. Give it a whirl and drive the spaceship into the cannon. Notice that the sound effect is a little odd. 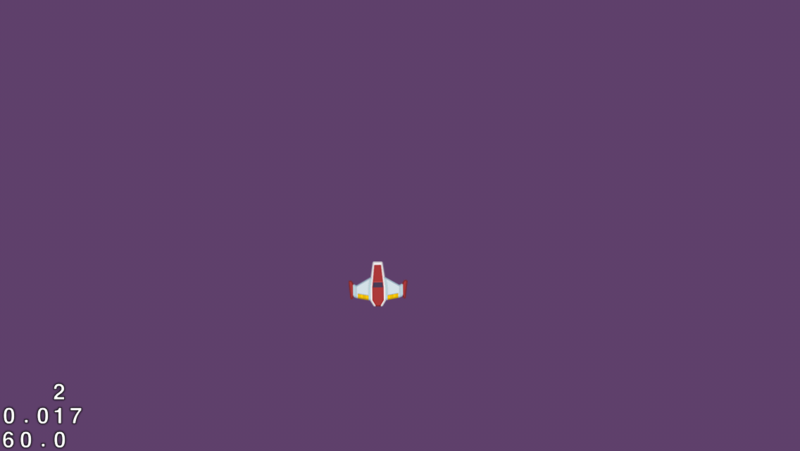 It’s because while the spaceship flies over the cannon, the game registers repeated collisions, one after another. There isn’t just one collision, there are many, and it plays the sound effect for every one of them. Collision detection is only the first step. The second step is collision response. Not only do you want to play a sound effect, but you also want the spaceship to bounce off the cannon. This is similar to what you did for making the spaceship bounce off the screen borders. Build and run to see how it works. It works pretty well when the spaceship is going fast when it hits the cannon. But if it's moving too slow, then even after reversing the speed, the ship stays within the collision radius and never makes its way out of it. So this solution has some problems. 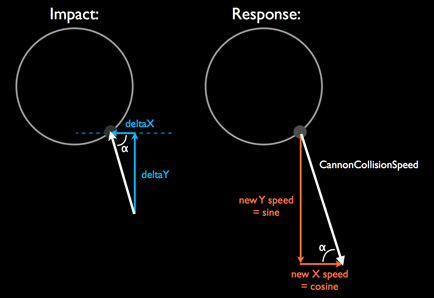 Instead of bouncing the ship off the cannon by reversing its existing speed, you will simply expel the ship with a fixed speed so that it always moves outside of the collision area, no matter how fast or slow it was flying when it hit the cannon. You can calculate the angle using arctan because you know the current speed of the player. 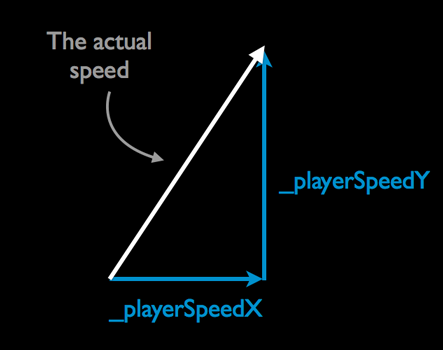 To calculate how fast the player bounces off the cannon in the x- and y-directions, you already have two pieces of information: the angle that you just calculated, and the new speed, CannonCollisionSpeed, which is the hypotenuse of the triangle. And that’s exactly what you're doing in the code above. Build and run, and you'll see the spaceship now bounces properly off the cannon and loses some hit points in the process. The amount of spin quickly decreases over time – I chose a speed of 720 degrees per second. Once the spin has reached 0, it stops. Here is the full example project from the tutorial up to this point. Triangles are everywhere! You've seen how you can use this fact to breathe life into your sprites with the various trigonometric functions. You have to admit, it wasn’t that hard to follow along, was it? Math doesn’t have to be boring if you can apply it to fun projects, such as making games. 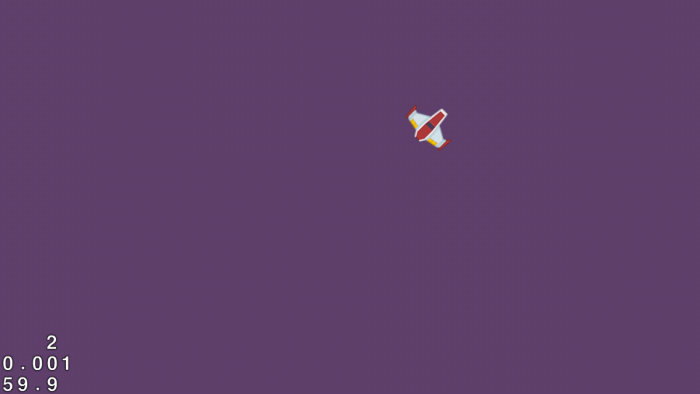 But there's more to come: in Part 2 of this Trigonometry for Game Programming series, you'll add missiles to the game, learn more about sine and cosine, and see some other useful ways to put the power of trig to work in your games. In the meantime, drop by the forums to share how it's going for you so far! Or if you really can't wait until part 2, why not brush up on some more Cocos2D with some of our other tutorials. Alternatively, if you want to start diving into more game development why not take a look at the games starter kits available on this site.